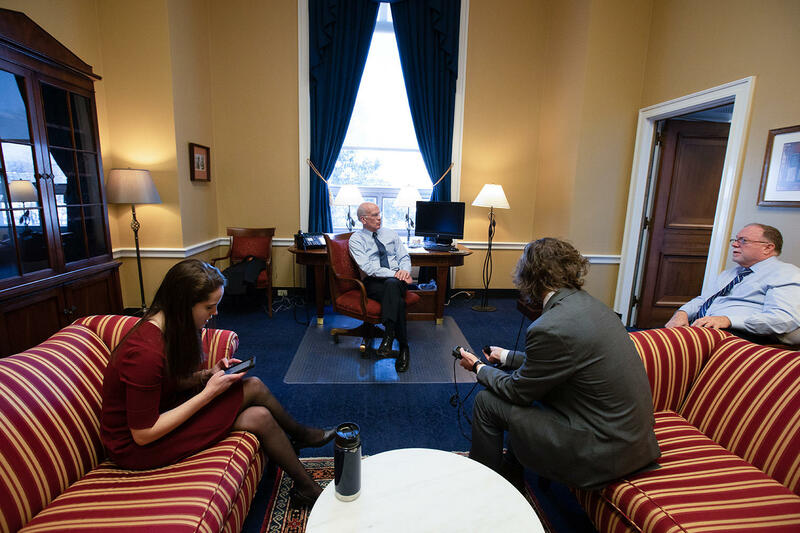 As Brave Little State spent time on Capitol Hill in January to answer a listener question, we wanted to be sure to capture both the sounds and the sights. Brave Little State, VPR's people-powered journalism project, has paid particular attention to Welch, a Democrat, as his party has taken control of the U.S. House of Representatives. And as we spent time inside the beltway during the month of January to answer a listener question, we wanted to be sure to capture both the sounds and the sights. You can find our full episode, about how Welch is going to balance the work of passing legislation with the work of investigating President Trump, here. In the meantime, please enjoy this photo diary of a day in Welch's life: January 15, 2019. Welch, 71, starts his day with a 5-mile run he dubs his "three branches" run, around the United States Supreme Court, the Capitol and the White House. Welch starts the day with a 5-mile run along a route he’s dubbed his “three branches” run. 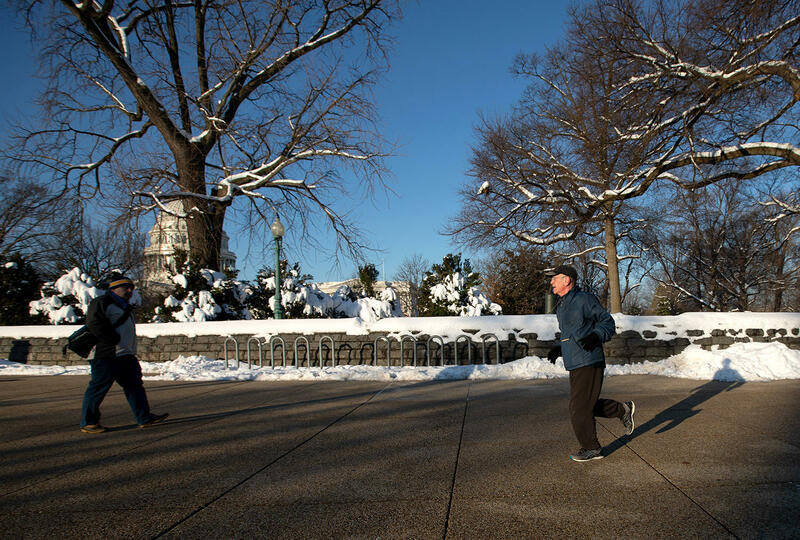 The 71-year-old leaves his apartment, which is by the Supreme Court, and then runs across the grounds of the Capitol and around the White House. 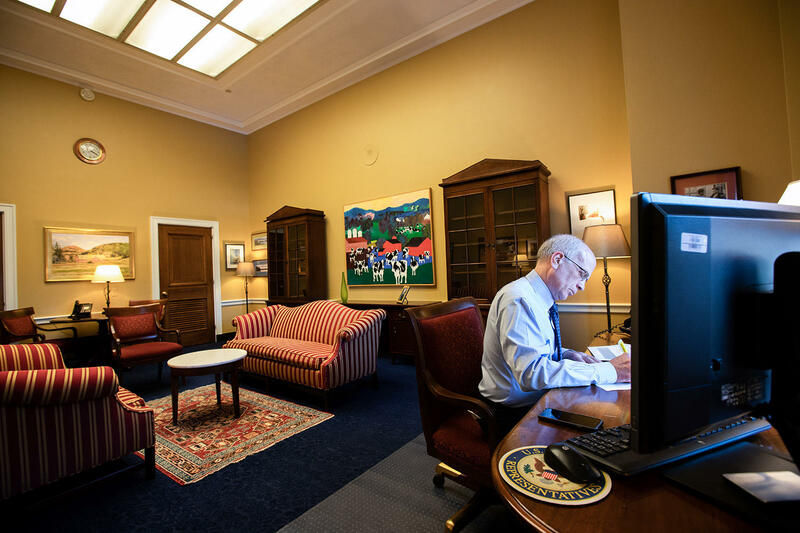 Welch has a pretty short commute to work everyday; It’s about 15 minutes to walk from his apartment to the Rayburn House Office Building, the building that houses his office. When he gets into the office this morning, the first thing on the agenda is to prep for a floor speech about the government shutdown. Welch’s staff has been collecting stories of Vermonters affected by the partial government shutdown, and he plans to share some of those stories on the floor. Rep. Welch prepares for a floor speech about the partial government shutdown with his chief of staff Bob Rogan, far right, and press secretary Kate Hamilton. Welch spends additional time preparing for his floor speech. 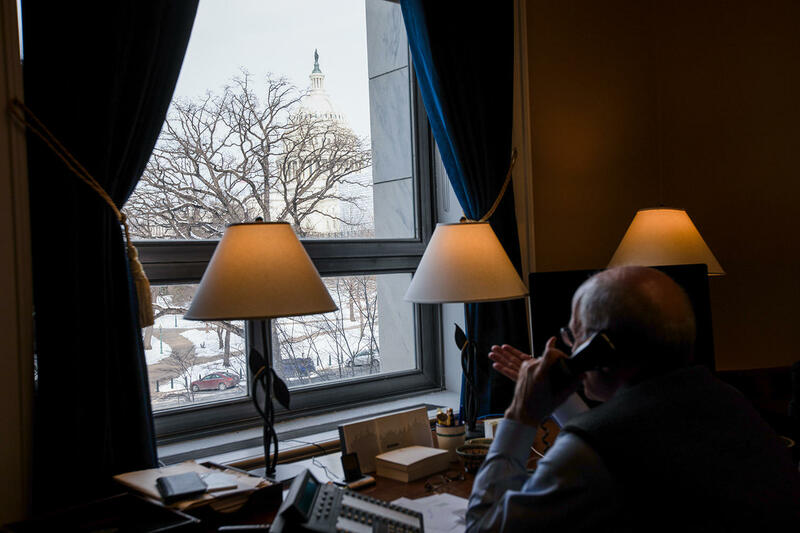 As of mid-January, he was still settling in to his new office in the Rayburn House Office Building. During his speech, Welch talks about the experience of a border patrol officer who isn’t being paid, and is having trouble paying for heating oil and making child-support payments. The congressman also talks about a construction company that can’t get a project started. “They were recently awarded a $2 million construction contract, but they can’t get the permits signed because the permit signers are on furlough,” he says during his speech. This situation is not a direct impact of the shutdown, but an example of less visible secondary effects of the shutdown. “We will not cause collateral damage to others to get our way,” Welch says during his conclusion. After his floor speech, Welch answers questions from a reporter with the Washington Examiner. Welch answers questions from a 'Washington Examiner' reporter, right, after delivering a speech on the House floor. That's VPR's Liam Elder-Connors on the left. 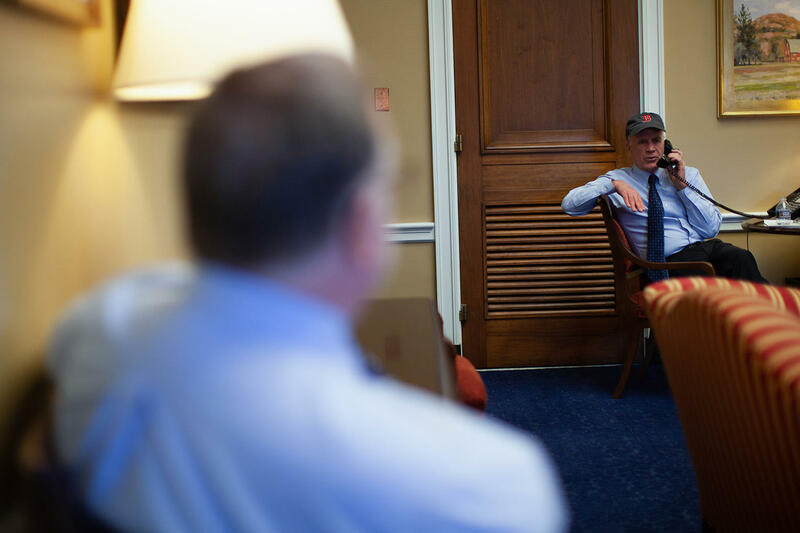 After that, he has a private meeting with his chief of staff, Bob Rogan — then he does another interview, over the phone, with WAMC, a public radio station in Albany, N.Y.
Rep. Welch wears his "lucky" Boston Red Sox hat during a phone interview with WAMC in Albany, N.Y.
Then Welch and Rogan head down to lunch, in the Rayburn cafeteria. Both fill up their paper bowls with mushroom and barley soup, and walk over to an empty table. 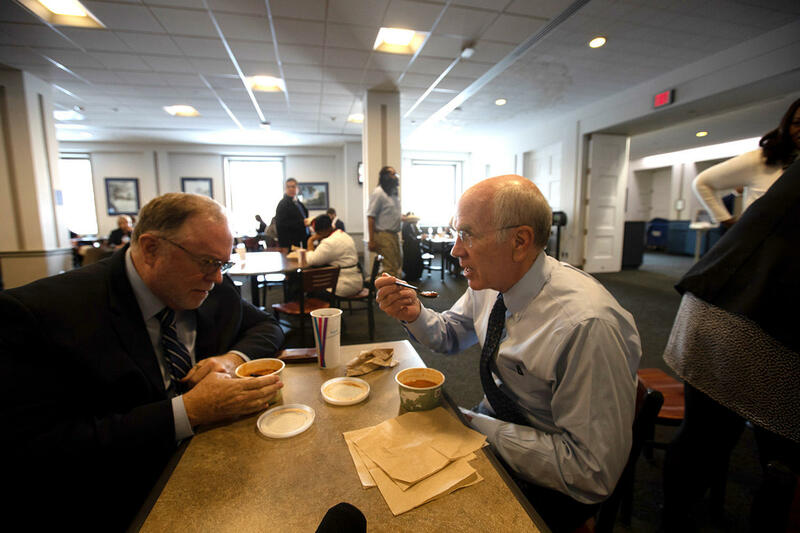 Rep. Peter Welch and his chief of staff Bob Rogan eat lunch in the cafeteria at the Rayburn House Office Building. After lunch, Welch has a meeting with consumer advocate groups who support efforts to lower the price of prescription drugs. The meeting is behind closed doors, but afterwards Welch says it went well. Lowering prescription drug prices is an issue that Welch has been pushing for a while now, and with Democrats in the majority, he says his party can now set the agenda. It’s a significant change — Democrats haven’t had a majority in the U.S. House since 2011. 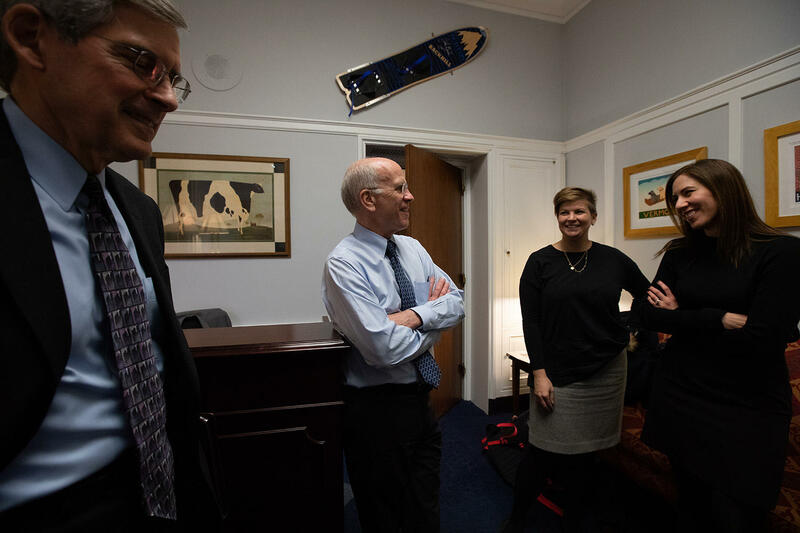 Welch chats with members of consumer advocate groups before a closed-door meeting about prescription drug prices, an issue he has long championed. 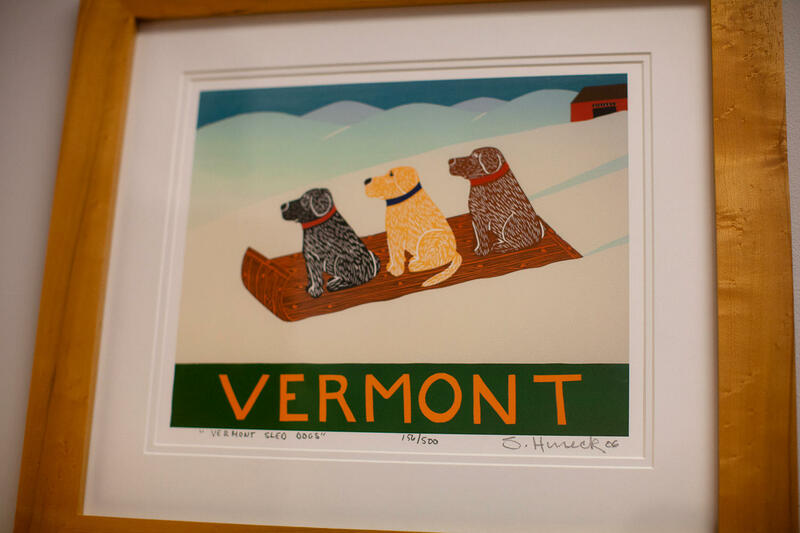 There's no place like home: A print by Stephen Huneck hangs in Welch's office. 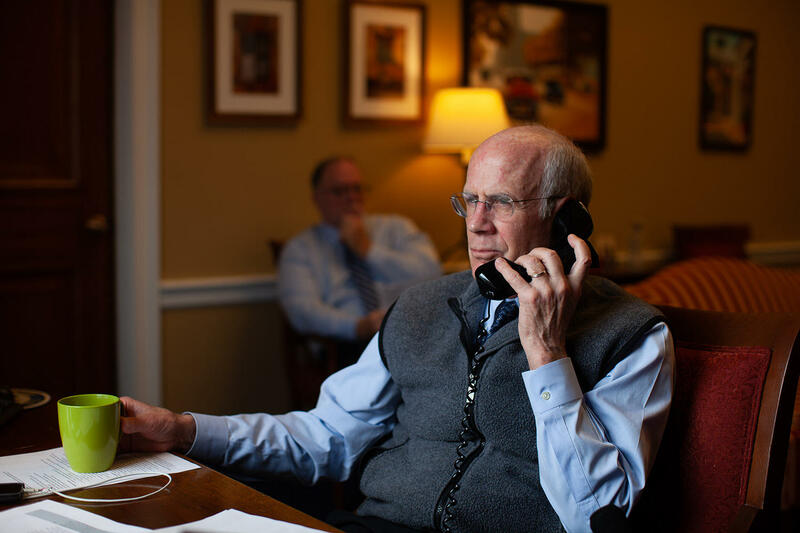 After the meeting on prescription drug prices, Welch spends some time on the phone calling Vermonters affected by the partial government shutdown. Most calls would end with Welch telling the person on the other end of the line that he was working hard to get the government back open. 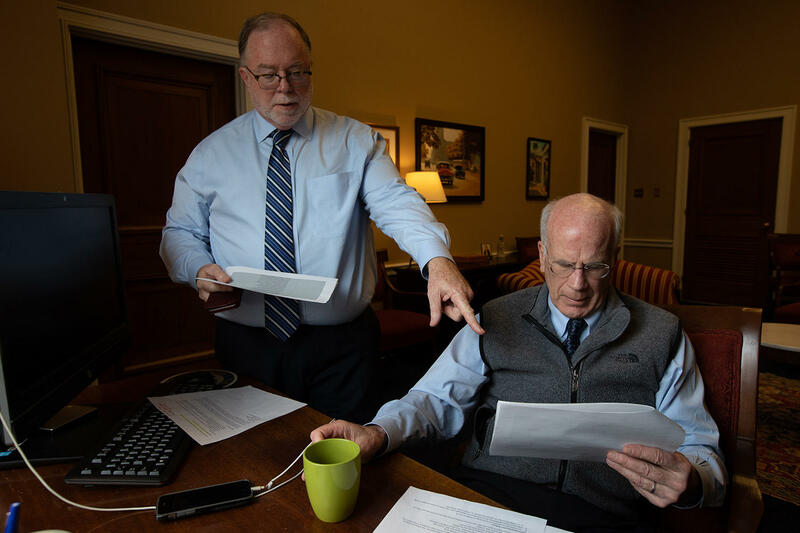 Chief of Staff Bob Rogan preps Welch to make phone calls to Vermonters affected by the partial government shutdown. Congressman Welch listens while talking to a Vermonter. A view of the Capitol dome from Rep. Welch's office. As the day continues, a theme emerges: meetings. Some are small meetings with staff or other members. Others, like the ones he heads to this afternoon, are bigger. This is the organizing meeting for the House Energy and Commerce Committee, one of the committees on which Welch sits. The Energy and Commerce Committee has broad authority, with a number of subcommittees that will work on the various issues under its jurisdiction. The organizing meeting is how members of Congress decide who gets those subcommittees. 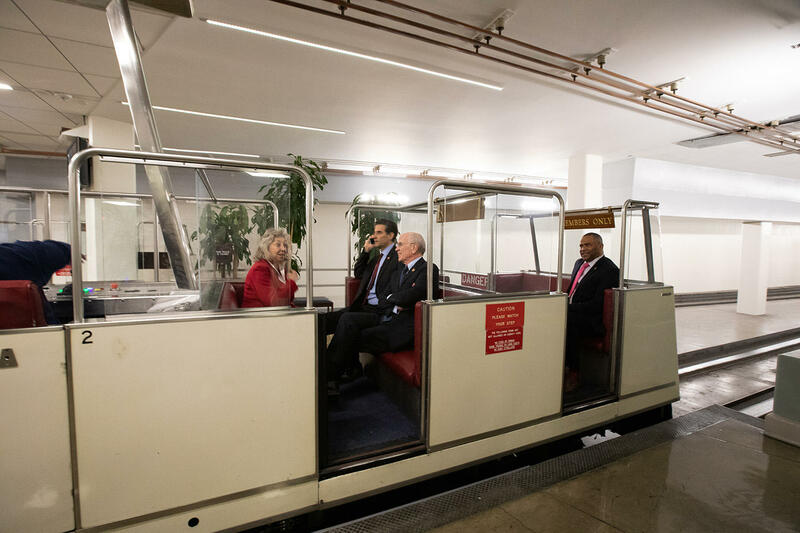 Congressman Peter Welch chats with a colleague while taking the Capitol Hill Subway system on his way to cast a vote. Welch ultimately gets the three subcommittees he had wanted: health, energy and communications. On the health committee, he says, work will begin on improving the Affordable Care Act and lowering prescription drug prices. “So, for an affirmative agenda, it’s a terrific committee to be on,” he says. After a floor vote on three bills, the last thing on the congressman’s schedule is a staff briefing. 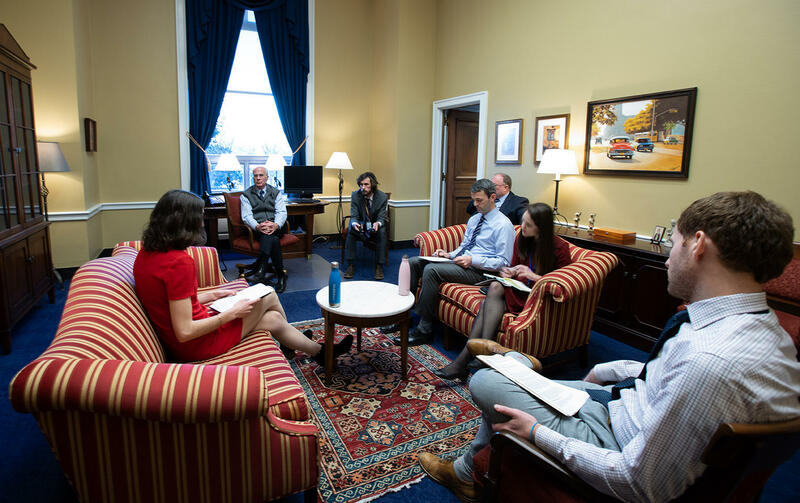 The day ends with a staff briefing in Rep. Welch's office, with discussion about a new bill to ensure some federal workers continue to receive their paychecks during future government shutdowns. 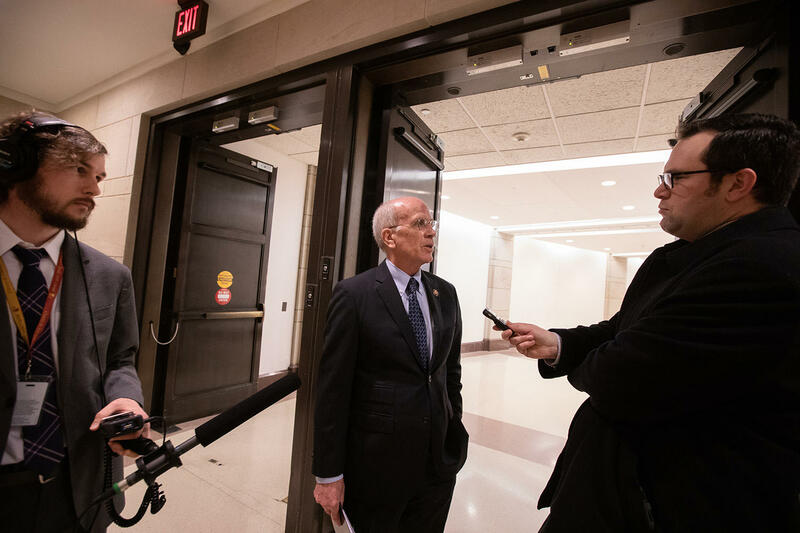 Want to know more about what Rep. Peter Welch is up to in Congress? Listen to our latest episode. Photographs by Eman Mohammed. Brave Little State has support from the VPR Innovation Fund; additional support for this reporting came from the VPR Journalism Fund.